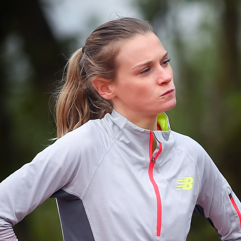 21 year old Katie Kirk is a rising star in the world of middle distance running. She was chosen by Dame Mary to carry the Olympic torch at the 2012 Opening Ceremony in London and since gone on to become the third fastest 800m runner in the Irish Women’s rankings. As well as completing a degree at Queen’s University Belfast, she has her sights set on Olympic Games in Rio this year.